Legal Status: U.S citizen with no known criminal record . Skills and abilities: Innate leader and capable street fighter and brawler. Powers: She is a metahuman with the power to ride one’s emotions. She can use this to see the emotional connections that one has with those around them. She can also use these connections to astral project herself into their vicinity. She can also sense the emotional state of others and shift into a state related to emotions in this state she is intangible and can fly. She can also induce emotional states in others and even enhance them so they can be used as an effective weapon. She has access to the emotional spectrum allowing her to access Green energy for will power, yellow for fear, purple for compassion, Orange for greed, pink for love, blue for hope and red for rage. She has deep empathic abilities allowing her to sense the emotions of those around her. Virtue can merge with emotions to track people over vast distances, fly and levitate, manipulate the emotions of those around her, augment her physical abilities and fire them as force bolts from her hands. Born into an unnamed family with the ability to access the emotional spectrum, the same accessed by the Lantern corps of the universe. Her grandmother was the strongest of her bloodline and was burned at the stake after being mistaken for a witch. Her mother had power at a different degree and had no problem finding a husband and getting married. When her powers manifested she accidentally put her father in a hospital. He did not recover for weeks. Her mother in fear sent her away to her aunt told her father she was dead. Her father never recovered psychologically and went on to rob a bank with an empty gun and was shot by detective Meers. She hated Meers as he was promoted to Captain and all hope of a family reunion was shattered [The Movement #12]. Holly is the leader of the Movement. She makes her debut roughing up a police officer after her team take over a few districts because they no longer trust the cops [The Movement #1, 2013]. She welcomed Burden into their fold which drove a wedge between herself and Katharsis. While tracking down her teammate they ran into Rainmaker [The Movement #2]. After making a truce with Rainmaker she storms the police station to rescue Katharsis who was taken hostage [The Movement #3]. The manage to take back catharsis only after going to war with the cops but gain aid from Rainmaker [The Movement #4]. 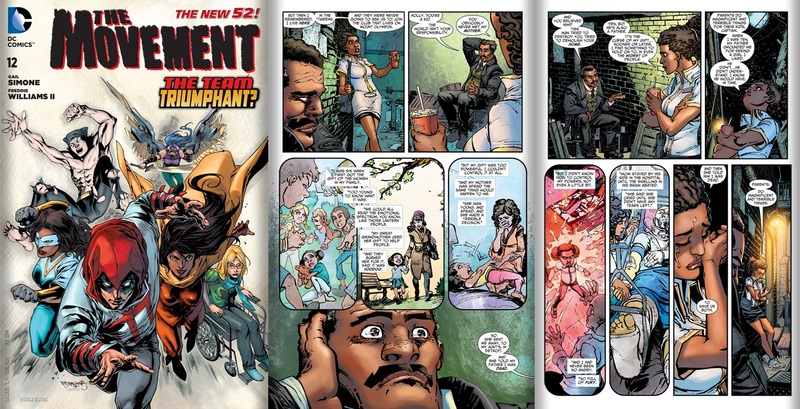 While she meets with the captain the two cops she had hostage escape and tremor quits the team [The Movement #5]. When the graveyard faction which included Pallas attacked their stronghold after Rat boy had been injured. She used her powers to quickly dispatch them [The Movement #8]. The team later battles Batgirl/Barbera Gordon [The Movement #9]. They aid her in tracking down a misunderstood killer during the ordeal Katharsis and the killer bond after making love. 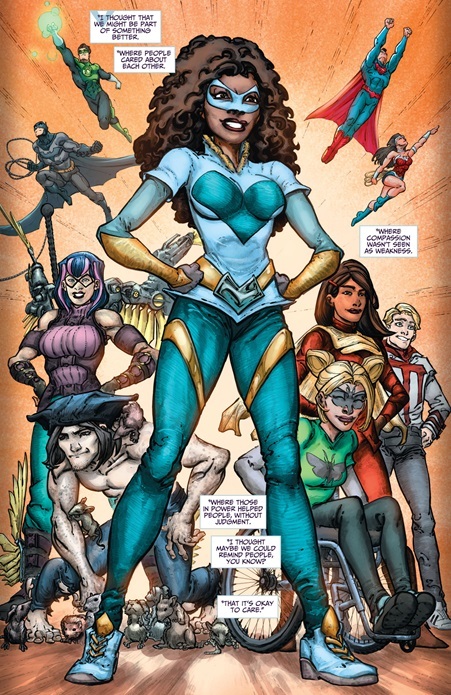 She parts with Batgirl on good terms as allies [Movement #10]. While on a date with her lover, Sarah she and her team are forced to rescue Burden from his brother Jacob [The Movement #11]. At the end of her adventures she met with Captain Meek and reconciled her becoming his daughter figure and him becoming her father figure [The Movement #12].